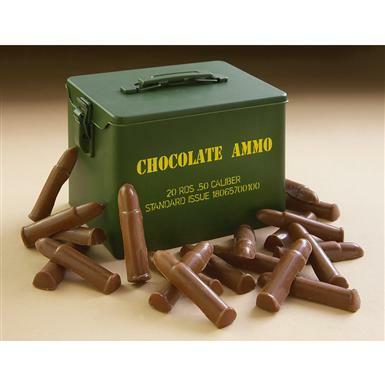 Chocolate Ammo in a Novelty Ammo Can! BIG BUCKS OFF! Go ahead and "bite the bullet"! This mini Ammo Can is loaded with 20 rounds of sweet .50-caliber milk chocolate bullets, making a tasty and memorable gift for any occasion! After the chocolate ammo is spent, the stackable and lockable 5" x 3 1/2" x 4"h. container can be used as a storage can or makes a great conversation piece. USA made.